The Olympics has provided us with hundreds of memorable moments throughout its history, but some are more inspirational than others. 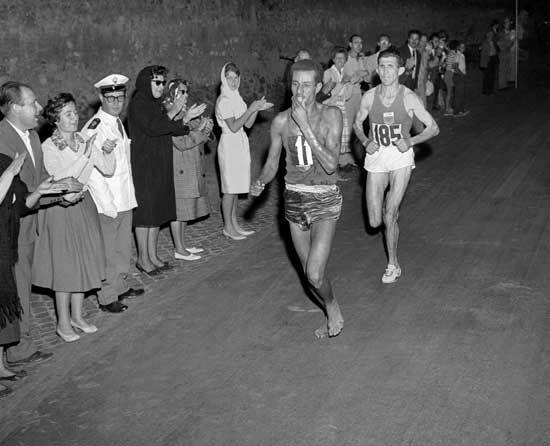 Here are ten moments that transcend sports, and show us the power determination and sportsmanship. Some things are just more important than Olympic medals – family is one of those things. 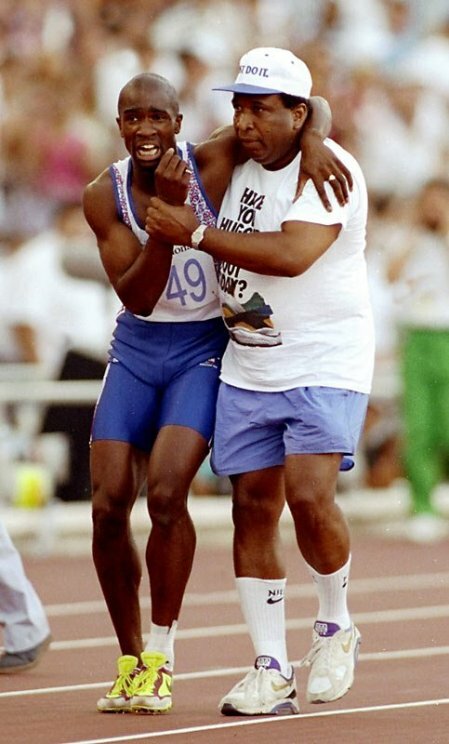 British runner Derek Redmond seemed to have finally broken free of the injuries that had plagued his entire career coming into the 1992 Olympics. However, in the final 250 meters of the 400m semifinals, Redmond began to hobble. He fell down on the ground in pain, with the medical staff quickly running over. However, he got back up, and hobbled towards the finish. His father, Jim, broke free from security and dashed onto the track. The two of them slowly made their way across the finish line, as the crowd cheered them on. Redmond was disqualified for being assisted, but no one really cared about the results at that point. American Greg Louganis, one of the greatest divers of all time, won gold in both events in the 1984 Olympics, and was the overwhelming favorite in the 1988 games. However, he suffered a concussion during the preliminary round of the 3 meter event after hitting his head on the springboard. Louganis came back to win the preliminary round, and won the gold medal in the finals. He would also win the 10m gold a few days later. 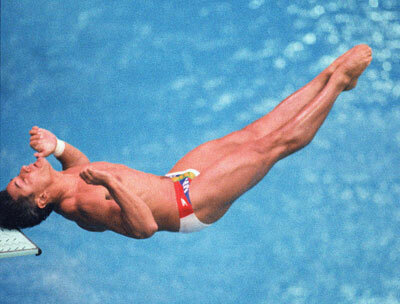 Louganis, who is openly gay, created controversy in 1994, when he revealed he was HIV-positive. However, experts say the other divers were at no risk, since the chlorine in the pool would’ve killed any trace of the HIV. In the 1968 Olympics in Mexico City, American Tommie Smith won the 200 meter in a record time. Australian Peter Norman came second, while another American, John Carlos, finished third. 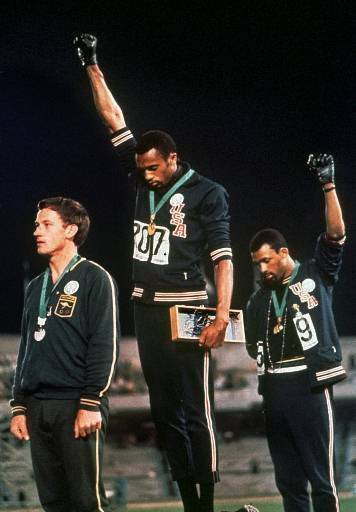 On the podium, Smith and Carlos, who were black, both raised one of their black-gloved fists in a symbol of black power. The Australian, Norman, wore a human rights badge on his sleeve in support, and helped the other two plan their salute. The two Americans were booed off the podium by the crowd, and were later expelled from the Olympics for failing to keep politics separate. All three men were ostracized in their home countries, and Norman wasn’t picked for the following Olympics, despite qualifying. Carlos and Smith would be pallbearers at his funeral in 2006. But, their brave salute would have a lasting effect. Israel has dealt with a lot of tragedy in their relatively short history as a nation. One of those tragedies was the 1972 Munich Massacre, where 11 Israeli athletes were killed by a pro-Palestinian terrorist group, Black September. Israel pulled out of those Olympics afterwards, and failed to medal for decades. 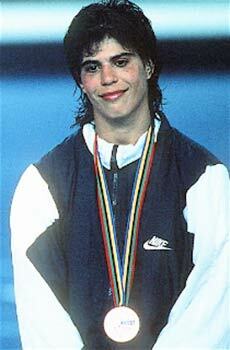 But in 1992, female judoka Yael Arad won silver on the 20th anniversary of the Munich Massacre. An emotional Arad dedicated her medal to the victims. After retiring, she now serves as a TV commentator for judo. She was named in a list of the 200 Greatest Israelis by the website Ynet. Coming into the 1996 Olympics, the Soviet Union had never failed to win the gold medal in woman’s team gymnastics. Their successors, Russia, were heavy favorites. USA held a slight lead on the final rotation on the final day of competition. However, the Americans performed poorly, lowering their lead. It all came down to Kerri Strug. On her first vault, she under-rotated and landed badly, damaging her ankle. Her coach, Bela Karolyi, told her she “better do it”, so Strug stepped up and performed a nearly perfect vault, landing on one leg. She then collapsed in agony, and was carried off by Karolyi. Strug didn’t have to perform her vault, as Russia had a series of mistakes on their floor exercise. But no one had any way of knowing this at the time. Not every inspirational moment is because of an athlete competing. Muhammad Ali was chosen to light the Olympic torch at the 1996 Olympics, despite suffering from Parkinson’s in 1984. Ali has gone through a lot of controversy during his decorated boxing career, but remains one of the most revered and respected athletes of all time. 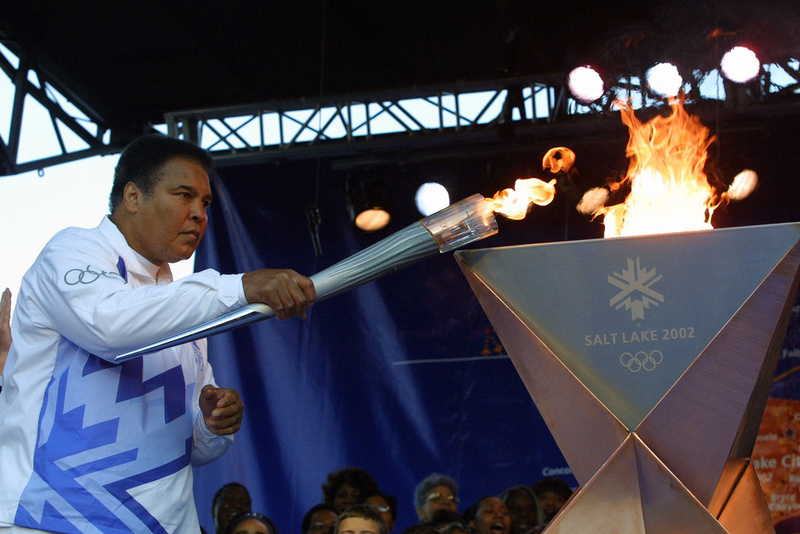 As he carried the flame to light the torch, Ali was visibly shaking from his disease. Despite his frail state, he remained a determined and brave figure. The crowd quickly grew silent in respect and awe of the outstanding athlete. 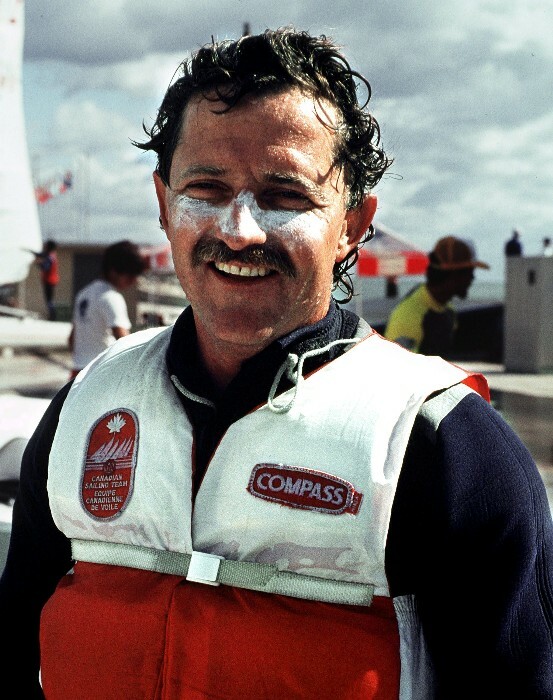 Canadian sailor Lawrence Lemieux was in 2nd place in the Finn sailing class at the 1988 Olympics when he saw that two sailors from Singapore had been thrown into the rough water off of Seoul. The two were injured, and there damaged boat was sinking. Lemieux broke away from the race and pulled the Singapore sailors onto his boat. He then transferred them onto an official patrol boat, possibly saving their lives. When Lemieux eventually finished the race, he had fallen from 2nd to 22nd. He was awarded the Pierre de Coubertin medal for sportsmanship. Only 15 have been given out since its launch. This may not be the most well known story, but it doesn’t make it any less inspiring. On July 16th, 2007, Steiner’s wife Susann, whom he had moved to Germany from Austria and switched citizenship for, died in a car crash. Steiner swore at her hospital bed that he would win gold for her at the following Olympics. However, failed attempt after failed attempt in the super- heavyweight weightlifting competition made that promise look unlikely. Then, Steiner raised his weight by 10kg, a huge increment for weightlifters. When he finally lifted his weights, he secured the gold. 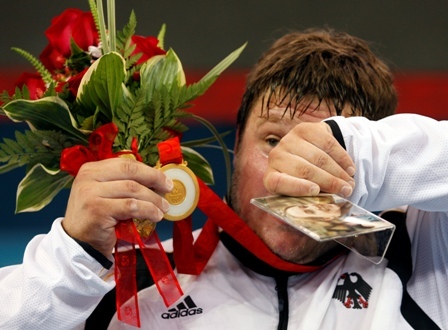 An extremely emotional Steiner clutched a photo of his wife as he received his gold medal on the podium. Adolf Hitler wanted the 1936 Berlin Olympics to showcase his belief that whites were the dominant race. However, one man ruined all his plans. 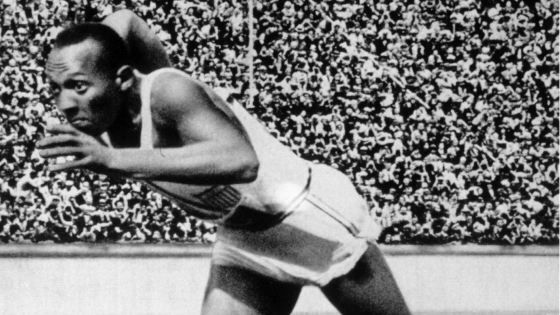 Jesse Owens won 4 gold medals, the most of any athlete. Owens won the 100m, 200m, and long jump, and was a part of the 4x100m relay team that won. Hitler refused to shake hands with any medal-winning athletes at the closing ceremony, an action that prompted speculation that Hitler was refusing to acknowledge Owens’ accomplishments. However, Owens graciously denied this, saying he had waved at Hitler during the ceremony, and Hitler had waved back.